Membership fees are now due for the year. Please visit the documentation section to find a membership form that can be filled in and returned either in the post or on Tuesday nights club sessions. 20/01/2015 - Fancy a new swimming cap? Still swimming in the sea? These hats prove what a brave (or stupid) sea swimmer you are! But there are some rules...You have to earn them! Chilly Dipper (Orange) - 12 degrees or under for 10 minutes or more! Beluga (Blue) - below 9 degrees for 10 minutes or more! If you wish to purchase after successfully completing the challenge, they costs £5 each. Photographic evidence is accepted, if no committee member is present! Just reminding you that we are taking part in the BLDSA Postal swim again this year. Basically, we count the number of lengths you swim in an hour. The junior session will swim next Tuesday 10th at 6.30pm and the seniors will swim Tuesday 24th at 7.30pm. Please turn up early so that we can start promptly and please bring along someone who can record your number of lengths. Well done to everyone who took part in the swimarathon on Saturday. We raised about £1000. Well done to Chantelle for organising the teams. Just a reminder that pool training at the Aquasplash starts again on Tuesday 21st April, so that gives you an extra week off! It is a short term of 5 weeks finishing on Tuesday 19th May. After May half term we shall be swimming down at St. Catherine's on a Tuesday night. Keep an eye on your emails for our Sunday swimming programme soon. The swim calendar section of the site has been updated with organised swims up until the end of June. We are still waiting to hear the dates for the JSC sea swims and so will send out the full programme then. As you might be aware, a couple of years ago we hosted an inter services round island relay event raising money for Holidays 4 Heroes. 5 teams took part including one from the JLDSC. We are hosting a similar event this year again raising money for H4H. The committee have decided that if possible we would like to enter a 6 person team of youngsters. So if you are aged between 14 - 18 and would like to be involved then please let Jennt know (fitz18@hotmail.com) and she will send on more info. The dates for the event are Saturday 12th - Friday 18th September. Pool swimming at the aquasplash has now finished for the summer. There is no swimming next Tuesday because of half term week. Tuesday nights resume on 2nd June at St. Catherine's at 6.30pm for everyone. ﻿It is just over a month until our first Round Jersey swim and we are looking for volunteers to help out on the boat this summer. Initially a volunteer would not necessarily require an RYA qualification, although that would be more than useful.The main requirement would be that once on board it may be twelve hours or more before you touch dry land again. So it helps to be able to 1) stay awake for long periods of time. 2) be able to either start very early or finish late. 3) act without any form of reimbursement. 4) be 16 or over . 5)have a sense of humour. Congratulations to Team Coniston - Sylvia Trehiou, Wendy Trehiou, Adrian Follain, Dee Richards, Chantelle le Guilcher and Steve Holley (skippered by Mick Le Guilcher), who successfully navigated there way round Jersey on 5th July in a cracking time of 11hrs 21mins. The team have been waiting for this opportunity since 2012, but after waiting so patiently completed their swim in near perfect conditions. Well done team! There are plenty of photos listed on our Facebook wall so why not take a look!? Also congratulations to Andy Truscott who completed a Jersey to France swim with Lionheart Pilotage in a fantastic time of 7hrs 7mins. Well done Andy!! Reminder from Graeme Lowe regarding the Jersey Masters Meet. . The open water swim to be held on Sunday 20th September also doubles as our Senior Club Championships. In order to be eligible for the Club champs, you will need to complete and pay for entry into this event selecting the 3k or 5k option as per the form. Also you will be a fully paid up club member and have taken part in a minimum of 3 Sunday club swims this year. Our Club champion trophies will be awarded to the first male/female in 5km event. No wetsuits allowed for our club championships. The season well & truly has kicked in with some recent success in the open water. Wendy Trehiou completed her 5th crossing of the English Channel (only the single this time!) in a fantastic time of 14hrs 24mins on 25th June. There have also been 3 Round Jerseys attempted, with Sara Marley (12hrs 20mins - 16th July) & Lucy Roper (10hrs 37mins - 18th July) on-board Sea Swimmer 2 & Zoe Sadler with Lionheart Pilotage (11hrs 55mins - 18th July) all making the trip over from the UK to complete their swims respectively. Also we had Ashleigh McLeish who is from the UK, but has spent 7 weeks over in Jersey training and has been a very welcome addition to our club, attempt an English Channel solo on 15th July. Unfortunately her courageous attempt didn't end in success but credit must be made as the conditions were not great and she battled valiantly for the time she was in the water. Note - thats 98 cmopleted Round Jersey swims - whose going to be the 100th?!!?? Fantastic efforts from everyone! Well done!! An absolutely amazing day of swimming and plenty photos can be found on our facebook page. Well done to all swimmers and support crews on a very busy of swimming in perfect conditions! In addition to the swims, there was also the race to be the 100th completed Round Jersey solo swimmer. Before the day started, there had been 98 swims, which means Toni became the 100th completed Round Jersey solo swimmer. Congratulations Toni! And how can we forget a simply stunning North Channel swim recently. On 22nd July Graeme Lowe undertook this swim. The North Channel extends itself as a body of water between North of Carlingford Lough to Rathlin Sound. It is a fast and strong body of water running up and down the Irish/Scotish coastline. Graeme completed the swim in 12hrs 27 mins and is officially to date, the oldest man to complete this swim. An amazing achievement. Massive congrats to Graeme and also his 1 woman support crew - Bianca, and the IlDSA observer and pilot Quinton Nelson and his team. Congratulations to Lisa Biddlecombe (UK) who completed her solo J2F in 12 hrs 56 mins!! Then earlier today (03:52 specifically!!) Tasmin Powell, started her swim from Jersey to France - also with Lionheart Pilotage. She blitzed through the water - and the copius amounts of jellyfish too - in a brilliant time of 6hrs 48 minutes, thus becoming the local woman's record holder. As always a massive thanks to the crew for both swims, who without them the swim would not be possible. A special mention must go to the 'Chantelles' for their unusual style of cheer leading on Tasmins swim. There is a very 'cheeky' picture on our facebook group. Why not ask them all about it?! Apparently Sharpie's dont wear out anytime soon! So, its been another fantastic period of swimming for the club. On the 10th August, Wendy (Trehiou) became the first ever person to swim solo from St Malo to Jersey with Lionheart Pilotage. She completed this swim in a fantastic time of 24 hours 7 minutes. Her completed track is below. The approximate distance is about 38 miles. Click here to be taken to the JEP article about the swim. A massive congratulations to her from all at the JLDSC! On Tuesday we had our first ever Austrian navigate their way round Jersey. Sale Savel completed his swim in a fantastic time of 10hrs 48mins. Congratulations! However this was just a pre-cursor for what was to follow the next day. Also on Wednesday Prabhat Koli (16) became the first Asian/Indian swimmer to swim around Jersey in an equally impressive time of 10hrs 11mins. Conditions on Wednesday started out amazingly. Ross was aiming to break the record so pushed it relentlessly all the way round! The conditions changed dramatically on the north coast as soon as they turned around St Catherine's breakwater. The sea stayed big (F4) until they passed Grosnez into St Ouens bay. This caused Prabhat to suffer sea sickness and therefore feeling cold so he was accompanied for an hour by swim buddy on the boat Jordan Sleight (JSY) also 16, and in training for a round jersey relay next month. This helped no end and undoubtedly picked Prabhats confidence up and finished strongly and smiling in perfect conditions at the end thankfully! Prabhat has been in jersey for a month's sea training in preparation for his English Channel swim next month so this was a great preparation swim for him - they both had a bit of everything to swim through yesterday!! Prabhat was escorted by pilot Gary Hill in Copasetic, observed by Sally Minty-Gravett and looked after by Jordan Sleight. It was a fabulous 2 days day, very well done to all 3 swimmers and all crews involved!! 40 Years ago yesterday - the Channel Swimming Association organised an International relay race across the English Channel. The Jersey LDSC, formed in 1974 - entered a team - a very young team at the time Linda Devereux 14, Jane Luscombe 15, Robert De Ste Paer 14, Ian le Breton 14, Nigel Gates 19 and current JLDSC president - Sally Minty-Gravett 18. Linda and Sally were also in training for their Channel swims at the time too! The JLDSC team entered the race from France to England and came 2nd out of about 11 teams - beatng the Professionals also in an amazing time of 9hrs 50 mins! and many relays including 2 Channel relays. France swimmer - this will be her first Relay! swimmer and in training for Jersey to France swim. swims worldwide and several channel relays too. and round jersey relay - this is her first Channel relay. We have been very fortunate that 'Columbia Estates' have helped pay some of the expenses for the relay and 'Aura, Air and Sound’ sponsored our team shirts and swim caps. Good luck to the team!! Follow them here - CS&PF tracking - select boat as 'Anastasia' and the times between 0200 onwards from the 21st August. Happy tracking! UPDATE 10/09/2015 - The team completed the swim in a brilliant time of 13hrs 52m. Well done to all and a fantastic achievment in representing the JLDSC!! Here are the proposed dates for the junior series this September. They are subject to confirmation. We are aware that the Sunday swim is different to what is on the swim programme and that's why these still need to be confirmed. 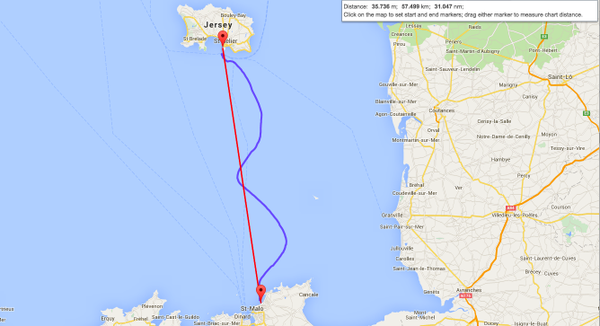 So Guernsey to Jersey, a swim that has eluded all but one person in history (Ruth Oldham). One man took it upon himself to rectify this and made it his mission to swim the 20 miles from island to island. And finally on the 5th attempt Neil Faudemer completed his epic swim. What an absolutely amazing achievement!! Congratulations from all at the JLDSC. On Sunday morning, in conjunction with the Jersey Swimming Club Open Water Masters Meet, we held our club championships. Although a low turnout of members eligible to race, those who did all enjoyed a great swim in lovely conditions with not a jelly fish in sight! The committee have decided to cancel all remaining Tuesday night sea swims due to the jelly fish problem. Therefore there will not be swims on Tuesday 22nd or Tuesday 29th September. Pool swimming will resume again on Tuesday 6th October, 6.30pm for juniors and 7.30pm for seniors. The night swim has been cancelled because of the jelly fish problem at dusk. Instead we would like to organise a swim at St Caths at 10am which would also act as our Junior Club Championships and part of the junior series. Nothing is definite at present so please let Jenny know if you intend to take part and then she will just keep you informed of the details. There is a change of plan to the Halloween swim on Saturday 31st October. It will now take place at Wayside slip, St Brelade's Bay at 7pm. Fancy dress and carved pumpkins optional! As per the norm for this time of year we had a good old fashioned party on saturday to celebrate all the successes of 2015. A fantastic hoe down was had by all. Pictures will be following very shortly so watch this space. Also a massive thank you to our 'Dinner Ladies Extraordinaire' Pat Roberts and Marilyn Le Guilcher. They are both amazing and their tireless work never ceases to surprise us all and is so much appreciated by so many; and the turn out was wonderful. Thank you to ALL the visitors who joined us in celebrating what has been another superb year for the JLDSC. Following this successful party the AGM was held. There have been a number of changes on committee. These changes have now been updated on our committee contacts page. We would all like to place on record our thanks and gratitude for everything Sally has done as president of this famous club. She was one of the original founding members and steps down after 27 years at the helm. She was done a wonderful job and will be handing over the club in good hands to new president Wendy (Trehiou) who also brings with her vast experience and knowledge in what we will surely be a seamless transition. In such grand fashion Sally's last act as president was to accept the honour on behalf of the JLDSC of being inducted into the International Marathon Swimming Hall of Fame. Click here for her thank you speech in recognition of this fantastic achievement. ​Finally, it may be November and it maybe cold, but dont let that stop you joining us for our New Years Day Swim at 1045. Venue TBC. Hope to see as many of you there!! 14/12/2015 - Christmas Pudding swim 20th December.